The 54th R&D 100 Awards & Technology Conference is coming right up, November 2-4. The conference, now in its second year, will open at noon on Wednesday and continue through noon on Friday. The Awards Dinner, where 275 Finalists are now eagerly waiting to see if they will be one of the 100 Winners this year, will be Thursday evening November 3. Last year, at the inaugural conference, we enjoyed great learning from top scientists, engineers, managers, and thought leaders from all over the globe – and a bit of fun at Caesars Palace in Las Vegas. Dean Kamen, inventor of the Segway, and the other keynote speakers participated in the conference as colleagues from beginning to end. R&D Magazine did a great job inventing a concurrent conference that complimented their renowned R&D 100 Awards. I was pleased to be invited to present at this first annual conference. My talk was on “R&D Complexity Increases In the Decade Ahead,” the areas that will keep us on our toes from increasing complexity. This year’s conference will be held just south of Washington, DC. R&D Magazine guessed the place would be hopping a week before the presidential election and they were right. It should be great fun again. I am pleased to be invited back for the second annual conference, this time to talk on two different subjects. 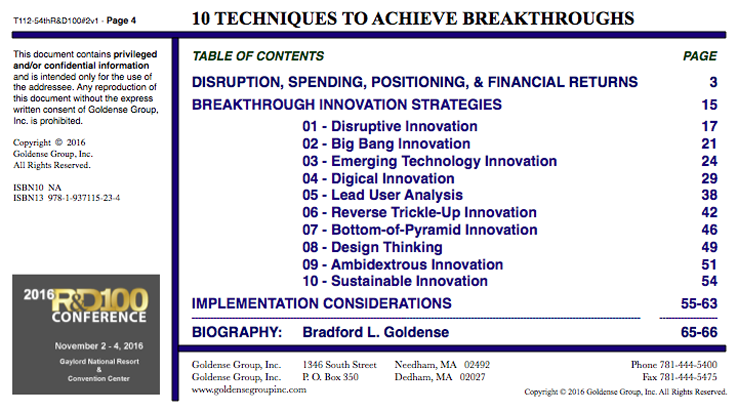 Earlier this year, GGI researched disruptive, radical, and breakthrough innovation. 2015 marked the 20th anniversary of Christensen’s work on disruptive innovation. It was time to take a snapshot of how the body of knowledge had evolved over two decades. 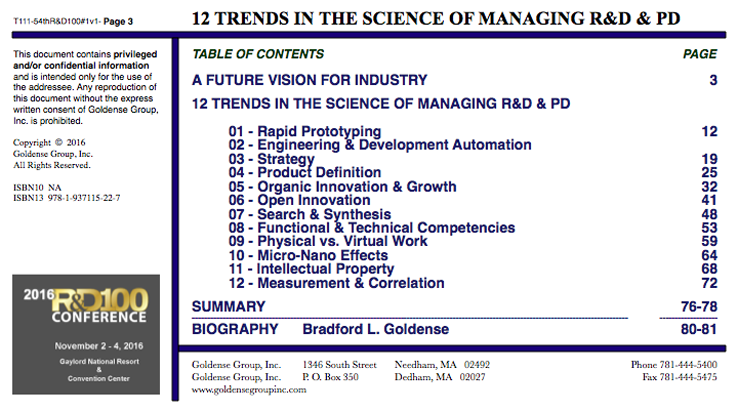 After my presentation last year on Complexity, R&D Magazine asked me to build off it and to make recommendations on how to manage in the decade ahead. I presented this work for the first time at a conference in Poland in April of this year. Subsequently, some areas have been refined and shored up. At the 2015 R&D 100 Awards Dinner last year at Caesars Palace some eight or ten different people, that had participated in either GGI’s Innovation or Metrics Summits or had been our clients, walked the red carpet to receive their individual or team member R&D 100 Award. A quick note to let you know that our 20th R&D-Product Development Metrics Summit is coming up, October 18-20 in Norwood, MA. Our conference facility is equidistant between the Providence and Boston airports, and a comprehensive renovation has just been completed. The place is beautiful and the food is great. Content is stimulating, and our Summit discussions and Workshop are great fun too. GGI has become significantly more active on Twitter in 2016. GGI Tweets content from our primary and secondary research and publications; and about GGI events and presentations. There are a number of substantive Tweets that went out October 7-9 regarding our recent work and near term plans. This entry was posted on Monday, October 10th, 2016 at 3:56 pm	and is filed under Blogroll, Research, Strategy, Tactics, Tools & Techniques. You can follow any responses to this entry through the RSS 2.0 feed. You can leave a response, or trackback from your own site.